Govaerts, R. et al. 2014. Alstroemeria in World Checklist of Selected Plant Families. The Board of Trustees of the Royal Botanic Gardens, Kew. Published on the internet. Accessed: 2014 Nov 04. Type species: A. pelegrina L.
Type species: L. psittacina (Lehm.) Raf. Type species: P. pallidum (Grah.) Raf. Govaerts, R.; Hofreiter, A. (2011) World Checklist of Alstroemeriaceae. Facilitated by the Royal Botanic Gardens, Kew. Published on the Internet;  Retrieved 2011-11-22. Linnaeus, Carl (1762) Plant Alstroemeria. 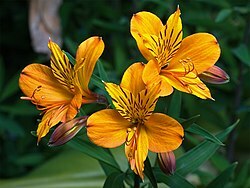 For more multimedia, look at Alstroemeria on Wikimedia Commons. This page was last edited on 23 March 2019, at 14:23.